FAQ: Do I Need an Attorney for a Separation Agreement in Orange County or Los Angeles? There are many reasons why a couple would opt to separate rather than get a divorce in California, from not being eligible for a divorce to personal and religious reasons. A legal separation is one way to end a marriage without divorcing, but they can often involve as much time in courts, with lawyers and in front of a judge as a divorce would. Another option that couples in California have is to create a separation agreement. While a separation agreement is a legally binding agreement, it is not the same thing as a legal separation, because it does not require the couple to appear in court to finalize the terms of the agreement. If you have questions about obtaining a separation agreement, contact a Los Angeles family law attorney. As with all legal documents, it is best to have an attorney look over a separation agreement before finalizing and signing it. What is a Separation Agreement and do we really need one? A separation agreement is a legally binding contract between the two parties of a couple. It allows the couple to live separately without obtaining a divorce by creating legal terms by which both parties must abide once they have separated. Like a divorce or a legal separation, the terms of a separation agreement cover all aspects of the separation, including child support, child custody, visitation, the division of property, debts, and assets, family support, and spousal or partner support. Every separation agreement is different. What you choose to include in your separation agreement depends on your current family situation, what you and your spouse or partner want for your future. A separation agreement is a way to end a marriage without completely severing ties. Following the finalization of a separation agreement, the couple is free to live separately. They can have separate property, assets, and debts, they can have a child custody and visitation agreement, they may have a child support order and a spousal or partner support order, and they can have options regarding things like insurance. Because the couple is still technically married, either spouse can still inherit from the other in case of death, and one spouse can provide things like health insurance for the other. The spouses may choose to file taxes jointly. However, following a separation agreement, neither party may remarry, because both parties are still married to one another. Why Would I Opt for a Separation Agreement? What are some good reasons I Would Opt for a Separation Agreement in California? There are numerous reasons why a couple might choose to create a separation agreement. 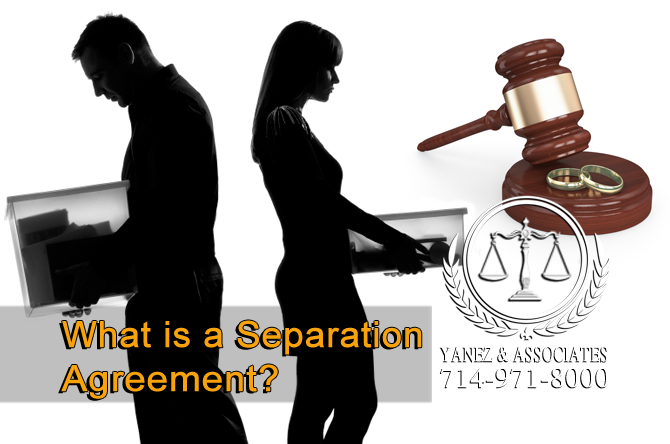 The most similar option to a separation agreement is a legal separation. The difference between a legal separation and a separation agreement has to do with the amount of time spent in court. A legal separation usually requires a significant amount of time to be spent in court, while a separation agreement does not. Separation agreements can be made entirely outside of court. Therefore, the greatest benefits to a separation agreement come from the freedoms it allows to the couple, from making their own decisions to creating the agreement on their own time, outside of court, and without being held to the judge’s time. This can be especially beneficial when children are involved, because it allows them to stay out of the courtroom and away from any potential custody battles. Couples might opt for a separation agreement instead of a divorce for several reasons. If a couple does not yet meet the requirements for getting a divorce in California, they may opt for a separation instead. Or, if a couple is not yet ready for a divorce, they may choose to separate. In these cases, the couple can choose to file for a divorce at a later date, and use their separation agreement as a base for their divorce agreement. Some couples choose separation instead of divorce for financial reasons, or to keep healthcare for both partners, file taxes jointly, or to meet requirements for military benefits, social security, or pensions. Sometimes, religious or personal reasons prevent a couple from getting a divorce. Depending on how you choose to create your separation agreement, you may have certain rights to privacy and confidentiality that would not be offered to you in a courtroom. How Do I Create a Separation Agreement in California? How Do I Create a Separation Agreement in California, will I need the help of a family law attorney? There are many ways that a separation agreement can be created. It can be as simple as a discussion with your spouse or partner over the kitchen table, or it can be done with the help of a trained, professional mediator, or you can choose to create your agreement in the presence of your attorneys. It is not generally advisable for anyone to create a separation agreement without at least consulting a lawyer. If you choose to create your agreement privately, between you and your spouse, make sure that you have a clear understanding of what you need to include in the agreement, what your goals are, your spouse’s or partner’s goals, and the legal requirements of a separation agreement. Every agreement is different depending on your situation. 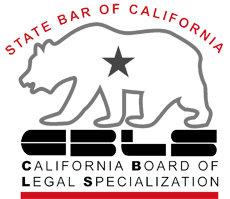 Couples with children will need to include sections regarding child custody and child support, and those sections will need to follow California law regarding the child’s best interests and California’s child support guidelines. A sample separation agreement can be found here. You also have the option to create your separation agreement with the help of professionals, while still avoiding the courtroom. Mediation is an option that can be used to solve numerous family law related issues, from child custody to separation agreements. During mediation, both you and your spouse or partner will meet with a mediator, who is a trained, third party, who must remain neutral, and whose job it is to facilitate a healthy discussion between you and your spouse or partner so that you can reach your goals, and create a healthy, legal, and mutually agreed upon separation agreement. Although neither party is allowed to have an attorney present during the mediation proceedings, it is advised that both parties consult with an attorney outside of mediation. One of the benefits of working with mediators is that they often have a background in law or psychology, and can help you understand how to create a top-notch separation agreement. There is also a process similar to a collaborative divorce where both parties work with their own attorneys and with each other at the same time in order to create a quality separation agreement. This method allows both parties to have the added benefit of legal advice present at all times during the creation of an agreement. 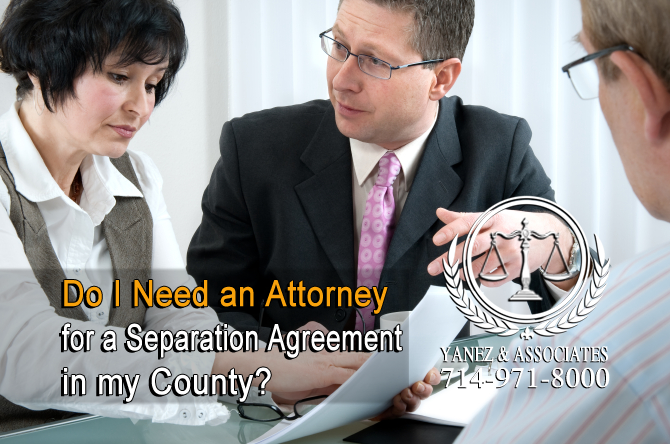 Do I Need an Attorney for a Separation Agreement in my County? I live in the County of Orange, Do I Need an Attorney for a Separation Agreement? While hiring an attorney is not a requirement of obtaining or creating a separation agreement, it is always advised that parties consult an attorney. A separation agreement can affect all aspects of the couple’s lives following their separation, as well as the lives of their children and other family and friends. It may be used as the basis for a divorce settlement in the future. Hiring an attorney allows you to have the best insight into the law. Your lawyer can help you understand every aspect of creating a separation agreement. • A lawyer can help you understand the requirements of a separation agreement. • A lawyer can help you understand how to create a separation agreement. • A lawyer can help you understand how a separation agreement can help lead to a divorce, if you do decide that you want one in the future. Contacting a lawyer can also be a great way for you to find a skilled mediator, especially because mediators are often also attorneys or former attorneys. Call today to set up a free consultation with an Attorney to explore your options regarding Separation Agreements. If you have questions about separation agreements, or if you are ready to start creating yours, you should contact an attorney as soon as possible. The lawyers at Yanez & Associates offer free initial consultations, and we are here to use our experience to help you create the best separation agreement for your family situation. Contact us today to schedule your free initial consultation. 2 What is a Separation Agreement? 3 Why Would I Opt for a Separation Agreement? 4 How Do I Create a Separation Agreement in California? 5 Do I Need an Attorney for a Separation Agreement in my County? Do I Need an Attorney for a Separation Agreement in my County?, Frequently Asked Questions about Separation Agreements in Orange County, How Do I Create a Separation Agreement in California?, How To Get A Separation in California, Legal Separation, Legal Separation in Orange County, Orange County Separation Agreement Lawyer, Separation Agreements in Los Angeles, Separation Agreements in Orange County, What is a Separation Agreement?, Why Would I Opt for a Separation Agreement?